When noted contemporary art collector Diana Zlotnick was invited to select the artist for this exhibition, she chose Doug Harvey. Harvey's imagination - an unruly, fermenting whirlpool - plays out in a surprising variety of artwork: paintings, sculptures, films, alternative radio, performances, sound art, installations, mail art, comic strip drawings and zines (cheap, self-published magazines). The diversity of his output runs contrary to the conventional notion that an artist must commit to a single artistic direction. Harvey, who is best known as the art and culture critic for the LA Weekly, has strayed from that singular path. Attempting to characterize the breadth of his work, even when one looks only at his drawings and paintings, is challenging. For example he has drawn hundreds of small comic strip panels. He has also created large paintings on canvas done in overall patterns that cover the works from top to bottom. He has produced still other paintings, many featured in this exhibition, which consist of overlapping, artful jumbles of paint, collage and images. These are composed upon a single field of color, typically white, and seem to be arranged by caprice or by stream of consciousness. His approach to picture-making owes a debt to many, including Sigmar Polke, Kurt Schwitters, and particularly Robert Rauschenberg, as does Harvey’s use of collage and his many sources of imagery – popular culture, low and high art, technical illustration, religious iconography, and an active subconscious. He often works in the style of underground comics, drawing characters in simple outlines with flat colors and including handwritten dialogue. He liberally peppers his work with pasted newspaper clippings, clip art, and retro mid-century magazine ads. One example demonstrates the general tenor of these sources, a 1930s ad entitled Joe’s Temper Almost Broke Up Their Home, in which a domestic conflict is played out in several comic strip panels and resolved when the characters buy softer toilet paper. Its absurd silliness, appeal to blatant consumerism, and cartoon styling were the perfect grist for Harvey’s mill. Layered fragments of this ad have found their way into numerous collages and other works by Harvey. He is equally freewheeling in his use of painting techniques and materials, which range from kitchen shelf paper to urethane foam to traditional artist supplies. And do not look for pristine surfaces. These works are messy, with rips, stains and smudges. Harvey’s home/studio is a disheveled array of art pinned to walls, stacked carelessly in piles, or left outside to rot. His nonchalant attitude is refreshing in an art world relentlessly concerned with the preservation of unsoiled and untouchable art. When Harvey is finished with a project he moves on – done. Wait, maybe not. Most recently he has begun to paint back into works that have been weathered by the elements or inadvertently damaged, fully incorporating the deterioration into the visual fabric of his art. He has even begun to intentionally “pre-rot” materials for painting. Harvey’s mixture of sources and materials results in a narrative art that is lively, slyly humorous, wryly hip, and at times crude. These works exhibit the wit of an art world insider who chooses to appear at times either erudite or common, skillful or untrained, sophisticated or naïve. Like most good art, Harvey’s work is subversive and iconoclastic. 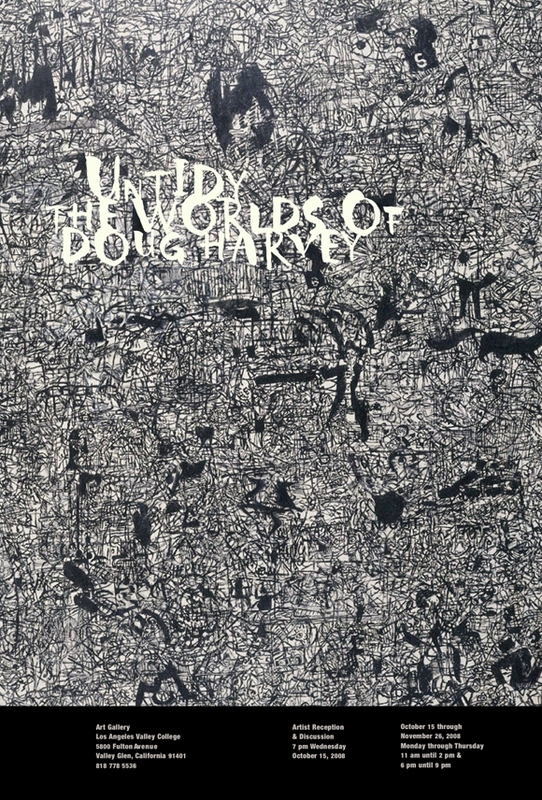 The broad range of Harvey’s artwork, from drawings to sound pieces, pack the Art Gallery from floor to ceiling with the detritus of his untidy, unabashed creative energy.